Nothing is better than an ice cold beer on a hot summer day, and nothing works up a thirst like a good bike ride. But if you don’t have a car, and your liquor store is miles away, your frosty beverage faces a risky trip home in the backpack. Let’s face it, bicycles weren’t built for carrying a 6 pack. Your options are limited. You can stuff a six pack awkwardly into a satchel. You can balance a plastic bag precariously over your handlebars. Or, you can use a handy dandy bike beer holder to carry your frosty beverages on your bike! You’ll look great doing it too. 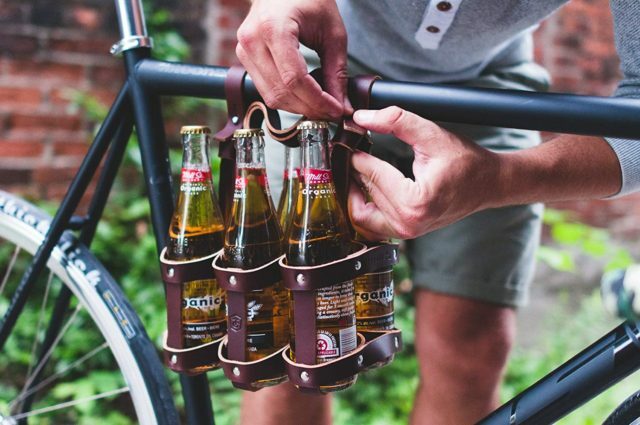 Yep, six pack holders for bicycles are a real thing, and they’re awesome. I find it’s way easier to justify a few suds after a calorie-burning spin over to my local brewery. So, in order to facilitate your frosty brew transportation needs, here are a few of the best bicycle beer holders and 6 pack carriers around today. Obligatory disclaimer: bicycle beer holders & carriers are meant for transporting your beer, not for drinking while cycling! Some of my friends seem to think drinking while riding is fine; those friends are very wrong. Seriously, don’t do it! Operating any vehicle while intoxicated is a bad choice. It affects your reaction time, coordination and judgment. Make wise decisions. This one is a bit specific, but if your 6 pack has a centre handle of any kind, you’re in luck. 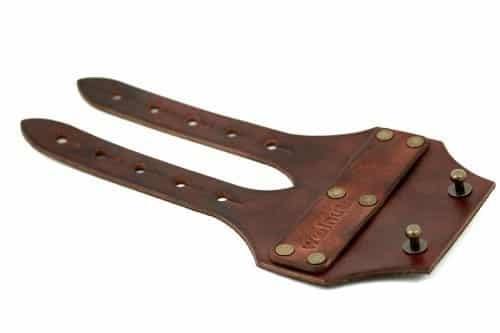 This frame cinch by Walnut Studiolo is a simple and brilliant bicycle beer carrier. It allows you to tote your beverage of choice home, hands-free. The system consists of a simple leather frame cinch with adjustable sizing, so it will fit any frame. The idea is to place the cinch around the top tube of your bike, and through the handle of your six pack. The beverages hang below in the bike frame triangle. This system has advantages: first, it allows you to tote your beer hands free. It centres the weight of the six pack in the middle of your bike frame, making the return trip much safer. And as a bonus, the cinch is tiny; you can tuck it away in a pocket or backpack. It’s beautiful, won’t scratch paint, and it matches the look of any vintage inspired bicycles with its dark brown finish (also available in honey or black). Worried about the ride home shaking up your beverages? Don’t be. Your drinks will stay remarkably steady as you pedal. It’s a winner. Sometimes the simplest ideas work the best. This is a clever canvas bottle bag that is super easy to use. You’ll love the utility. It’s a simple but well-made canvas bag with a handle at the top. Each side has three deep pockets. The exterior is lined with a colourful nylon-like material. How does it stay on your bike? It’s clever. The weight of your 6-pack (or wine, or whatever) keeps the bag nice and steady on your top tube. The inside has two strips of velcro to add another layer of security. It’s one of the best beer bottle carriers for your bike because it’s so simple to set up and use. Just load in your food and drinks, sling it over the top tube, and pedal away! As long as you’re not pedaling like a crazy person, you’ll be fine. It’s reasonably priced at well under $50, and you’ll get so much use out of this thing. Not just beverages; I’ve found it’s great for phones, shades, spare clothing, even a baseball. If you’re hunting for a cheap bike beer holder with utility and upside, this is it. Gah! 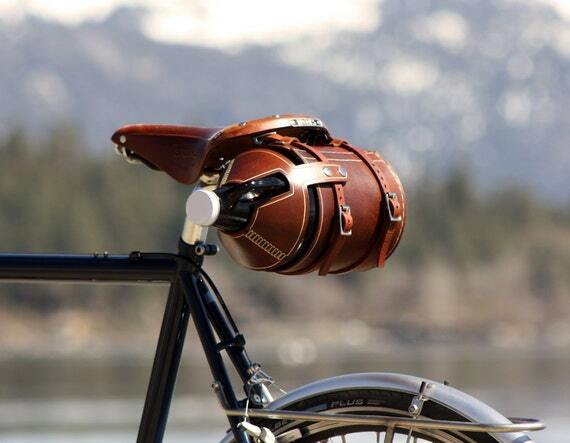 This beautiful leather Fyxation creation is such a good-looking bicycle beer carrier. It combines great looks with utility and simplicity, and I can’t stop looking at it. You just slip your bottles directly into this handy holder and cycle off into the sunset. Made from strong, full grain leather and fastened together using metal rivets, this carrier is built to last a lifetime. And oh, the looks you’ll get. Made in brown leather with top tube loops and a sturdy handle, you can affix it easily to your top tube and then carry it inside in style when you get to your event. Be prepared to get lots of jealous stares and comments from this item. It’s a conversation starter. The manufacturer would like to point out that beer is not included, sadly. Fyxation also makes a fantastic wine bottle holder for bikes in a similar style. Cycling sommeliers rejoice! Nothing is worse than realizing that your ice cold 6 pack doesn’t have twist off caps! Be doubly prepared with a dual purpose tool like the Surly Jethro Tule hub nut spanner / bottle opener combination. Fixed gear riders will appreciate this one. You can switch between your fixed and free cogs on the fly using the 15mm hex wrench at one end. OK sure it doesn’t have a ton of leverage, but it will work in a pinch. The other end? You guessed it! Bottle opener. If you’ve started getting into growler culture, and appreciate the low cost and great value of filling up a reusable beer growler at a craft brewery nearby, you aren’t out of options. PedalHappyDesign, a shop on Etsy, has an amazing (but expensive) growler holder that affixes to the back of your saddle. It’s a great way to get to and from the brewery with your precious cargo intact. They’re made of high quality leather and come in a range of colours from light honey brown up to black. I’m a big proponent of Etsy for bike swag, since the makers get to keep most of the profits! If you like the look of that growler holder, there’s a link to their shop under the image. If you haven’t gotten into the growler scene, it’s a great way to save a few bucks and support your local microbreweries! Stand up for the little guy and you’ll be rewarded for it. 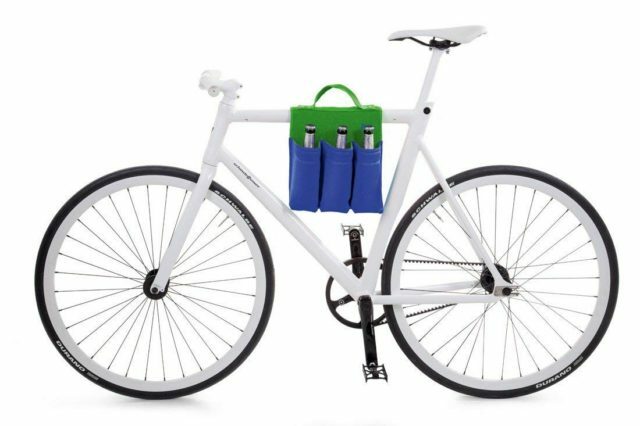 There are lots of new bicycle beer 6-pack carriers on the market these days. More people are choosing bike pedal over gas pedal, and they are hungry for the accessories to fit the lifestyle. Any cool holders and carriers I missed? Let me know in the comments below. Also: what are you drinking these days?